The expert team at MotorNuts recommend that you should check your engine oil, antifreeze and fluids around once a month and especially before a long journey. There has never been a better time to top up your oils and fluids as we have gone Nuts and have 10% off across the whole range. Firstly engine oil - choosing which oil may seem very confusing - is it fully synthetic, semi synthetic, and then there is the numbers (viscosity’s) – where to start? Don't go Nuts... simply enter your vehicle registration in our look up and that will narrow the search to what is recommended for your vehicle, and this information is also in your manual or handbook. Next up - transmission or gear box oil, it is the lesser known sibling of engine oil however equally important for gearbox and axle longevity. Most manufacturers recommend changing the transmission oil between every 30,000 and 60,000 miles. Antifreeze and coolants are next. These are essential to maintaining the engine temperature so it doesn’t get too hot or too cold and so is especially important to keep on top of in winter. The final under the bonnet check is brake fluids and power steering fluids, essential for obvious reasons and easily checked and topped up. The MotorNuts team also recommend treatments and additives as they can fix a variety of engine troubles and help avoid costly repairs. By simply adding them to your fuel they can work through your engine to clean build ups and maintain performance as well as maximising fuel economy and reducing emissions – we especially recommend running them through before your car goes for its MOT. Posted in Views, Advice on 10th September 2018 . If you’re going on holiday or long journeys in your car this holiday period our expert team at MotorNuts have compiled this handy checklist to make sure your car is ready for the trip. Firstly you need to check all your tyres are above the legal limit – a minimum tread depth of 1.6mm across ¾ of the tyre’s width. Once your car is ready and loaded to hit the road check your tyre pressures are what they’re meant to be – as stated in your handbook. And are you prepared if you get a flat or a puncture? space saver spare wheels can be a life saver to speedily get you out of sticky situation. It is also a great time to give your engine and systems a bit of TLC with one of our treatments or additives. Hot weather can mean hotter cars – so make sure your coolant level is topped up (always check when the engine is cold). Whilst we are talking about keeping cool we would also recommend you make sure your air con is gassed and working, we also really recommend running an antibacterial cleaner through it to make sure it’s as fresh as it is cool. Check your windscreen for chips and cracks and get anything over 10mm repaired. Top up your screen wash and make sure your wiper blades aren’t smearing or squeaking... because that would be nearly as annoying on a long journey as the unavoidable ‘are we nearly there yet’! You need to check all lights are working and change any bulbs that need replacing - so that includes:­Headlights – main and dipped, Sidelights – front and rear, Indicators – front rear and side repeaters, Brake lights, Number plate, Reverse light, Fog lights – front and rear and Hazards. In many European countries you need to use day time running lights and have to carry a bulb replacement kit. Holidays + kids = messy car! Our top tip to avoid the inevitable food and beach mess everywhere is investing in some carpet car mats to protect your original floor and make it easier to clean and de-sand plus we have seat covers to keep the mucky fingers off the seats! To make sure you are compliant wherever you go over sees we have handy driving abroad kits with everything you need including GB stickers, beam bender headlight stickers, warning triangles and much more. Posted in Views, Advice on 29th May 2018 . Your trusty Transit van is with you every step of the way; every delivery, every job – from early starts to butty breaks and the long road home. This reliable work horse works as hard as you do and then some so why not give your van a treat, inside and out with our tailored Ford Transit products. Protect your vans original interior with our Town and Country tailored fit heavy duty seat covers which are waterproof and stain resistant. Covers are available for the driver’s seat, double front passenger seats as well as custom crew and combi rear seat covers depending on your set up and for all the Ford Vans; Transit Custom and Connect plus the Ford Ranger pickup and Ford Minibuses. Simple engine treatments can improve performance, reduce emissions, increase efficiency, clean build ups and ultimately prevent engine mishaps and extend life span. We’d recommend MPEX Diesel Detox Pro – a multipurpose product this innovative treatment addresses all common deposit related problems, restoring performance loss caused by a dirty and inefficient fuel system. The much loved Haynes manuals cover everything for service and repair; from simple roadside fixes, through general maintenance and MOT checks to full restorations - always handy to have with you to check what’s what under your bonnet. With vehicle theft up as thieves out smart newer technology drivers are reverting to more traditional security methods. We have a massive range of vehicle security products perfect for your Transit; the Bulldog DC400 or Centaur CA 2000 wheel clamps, a Disklok steering wheel lock or external van door lock are all excellent visible deterrents. Are you prepared should you get a puncture in your Transit? To get you back on the road quickly and easily with minimal down time make sure you have a space saver spare wheel – we have different wheels for different years of the Transit Courier and Tourneo models. In addition to these 5 Transit essentials we have a wide range of accessories as well as all the indispensable car parts for the Ford Transit, the UKs best selling van. Posted in Views on 22nd February 2018 . True T5 fans are all about the customisation, making their beloved van stand out from the crowd, inside and out. Originally designed as a commercial vehicle the T5 has fast developed a cult following with many of them being customised into campers, as well as used daily for work and play. As practical as they are cool – they can be easily made even cooler with just a couple of simple alterations. Lowering the springs gives your VW T5 a sporty look as well as improving the handling and ride. One of the easiest ways to make your van stand out is upgrading to some custom alloy wheels - and we have a massive range for perfecting your VWs look. Calibre do both retro and contemporary design styles in a range of colours and finishes including metallic black, gold, polished silver, gunmetal grey, two tone and coloured trim. Both alloys and lowering springs and kits give your VW Transporter the modified, aftermarket look you desire and are available for Caravelle, California and Shuttle models. Less about the appearance and more about the practical usability – we have seat covers for the VW Transporters. And should you need a helping hand along the way with any jobs we also stock the Haynes manuals for the full range of Transporters from old to new. Posted in Views on 23rd January 2018 . Headlight bulbs aren’t just the simple replacements they used to be, there are now several options when it comes to your cars headlights and the MotorNuts team want to make sure you know what’s what when it comes to bulbs. All the evidence suggests that choosing the best bulbs is a savvy and safe move - the Department for Transport reveals that whilst only 15% of vehicle miles are done between 7pm and 7am, they account for almost a third of the road injuries and deaths. This combined with the fact that up to 65% of drivers are less confident driving in the dark and councils nationwide are switching off or dimming up to 2 million street lights means you need to take the lighting into your own hands. Typically cars have halogen bulbs but over recent years it became the trend and for some the preferred choice to move to LED or Xenon bulbs. As well as the standard Halogen bulbs you can then get performance bulbs which are brighter, the Ring H7 is a very popular option. LEDs started taking over the lighting world and then were considered for cars as well as – just like in your home they draw less power than typical halogen bulbs – more like 1.4 amps as opposed to 5 amps. They also throw the light further making visibility better. The Xenon HID Bulbs first started to appear in the luxury car market and were un-missable with their distinctive bright white light. Not just whiter and lighter – to be precise a colour temperature of 5500k white as opposed to 3000k yellow. Xenon HID bulbs – or High Intensity Discharge have no filament but a glass capsule of Xenon gas instead, they require a higher lighting current but use a lower running current meaning that like the LEDS they require less charge to run and subsequently last longer too. Why use Xenon HID bulbs over traditional halogen bulbs? A Xenon HID bulb will give off 3200 lumens as opposed to around 500 lumens from traditional bulbs halogen bulbs – they also last a lot longer. The Xenon HID performance upgrades take the 500 lumens of a traditional halogen bulb and smash them out of the water giving off 5,200 lumens of the brightest whitest light. number plate light and fog lights...even more so in Summer as you hardly use them but never know when you’ll need them with the British weather! Our final bulb tips - always change Xenon and LED bulbs in pairs to make sure of equal brightness and performance and always wear gloves to change them as any dirt on fingertips can affect the gas in the bulbs. Posted in Views and tagged bulbs on 5th July 2017 . The Formula 1 pre-season testing is now complete so we know who was fastest, fiercest, went furthest and we are more excited than ever for the furious fun to kick off on 26th March with The Australian Grand Prix. 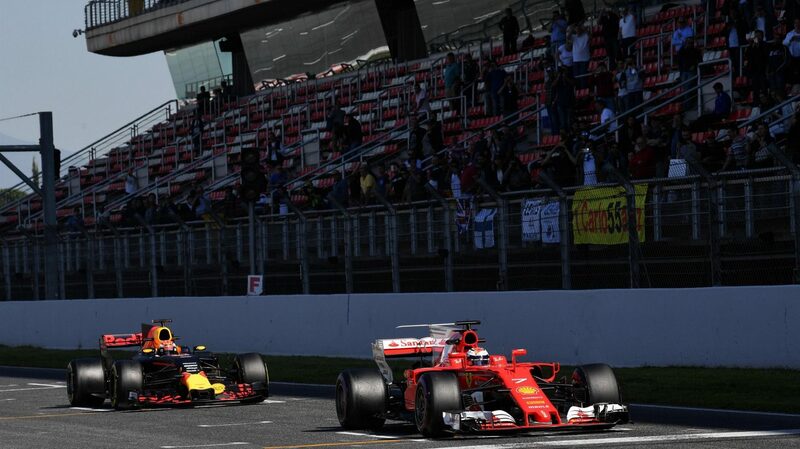 The 10 teams and 22 drivers all faced off over two, four day test spells at the Circuit de Catalunya, Barcelona and it was Ferrari that set the pace coming out on top with the fastest lap being clocked by Kimi Raikkonen just under 1minute 19 seconds. There was only 5 seconds between the whole pack, with Mercedes, Williams and Red Bull hot on Ferraris heels. Now it’s not just about the speed, the best way to look at a team’s performance is the reliability which can be seen in how many laps were completed and with how long between pit stops – and on this front it was the Mercedes engine cars that came out on top with McLaren’s Honda engine bringing up the rear. Finally the drivers: with the unexpected retirement of last season’s champ Nico Rosberg its Valtteri Bottas who joins former champion Lewis Hamilton at Mercedes. There is the usual switching and changing between teams and then another driver change on the retirement front is Felipe Massa coming out of retirement to race alongside Lance Stroll as team mates at Williams. Tune in to channel 4 and on sky sports for all the seasons action. Posted in News, Views on 15th March 2017 . The new car seat law - and why everyone is a bit baffled? For this blog we have called in Mummy MotorNuts who with two little ones and two not so little ones knows what’s needed to make sure everyone is suitably strapped in! First up the basics - as from March 2017 the law is changing on new child car seats sold. Basically unless a booster has a back, it’s no good. The law will state that only children over 22kg (3st 7lbs) who are also over 125cm (4ft 1in) tall may use them. The new law is that children must use an age/ weight appropriate child car seat until they are 12 years old or 135cm (4ft 5in) tall, whichever comes first. Next up the misconceptions, why is everyone getting confused - talking to my fellow Mummy’s people are worrying about seats they already have (which are not going to be affected) and also about the ever bubbling forward or rear facing car seat debate. In other countries the law keeps their little ones rear facing longer than the UK does...but that’s a whole different kettle of fish and a debate for another day. Now currently a child over the age of 3 can use a booster seat which uses the normal seat belt across them and crucially this new legislation puts a stop to this...which is a good job as anyone with a 3 year old will know that the wriggly little monkeys will outsmart a standard seat belt in seconds! You can now go straight from a rear facing group 0 car seat (typically used from birth to around 9 months) to a group 1,2,3 seat a high backed booster with harness - meaning you only need to buy two car seats. The group 1,2,3 high backed booster with harness grows with the child. Your little one uses the harness until they’re big enough that they outgrow it at which point you switch to the car seat belt which will by then lie in the correct position across their shoulder (and not their neck). There are other options – group zero car seats that aren’t carriers i.e that don’t pop in and out of the car with baby in them - these will work from birth to around age 4 and then you’d just go straight onto a high backed booster without harness. If you go into any car seat/ baby stuff retailer you will find there are endless choices and options based on personal preference – but what you won’t find from March is booster seats without a back. Posted in News, Views, Advice on 13th February 2017 .